Do you need better lighting inside and outside of your caravan? We’ll show you the options available to upgrade all the lighting in your caravan. Hi, I’m Briohny from Accelerate Auto Electrics and Air Conditioning on the Sunshine Coast. So let’s run through some caravan lighting options. Firstly, inside, if you want to save on energy through the day, we suggest upgrading your skylight to make better use of natural light. Most caravans and camper trailers come with a skylight as standard, but over time, these can deteriorate from exposure to the weather. Or your skylight might just be too small for your caravan. In either case, a new or larger skylight will reduce your reliance on artificial lighting throughout the day. Another upgrade is to switch to tungsten or energy-saving bulbs over to LED bulbs. LED light will far outlast your original bulbs, as they use far less energy. You can get LEDs in both warm and cool colour temperatures, and some even have a dimmable option. To change over to LEDs, it’s as simple as changing a globe at home. When it comes to indoor caravan lighting, there are heaps of options available on the market. From dome lights to square, to reading lights, and slimline surface lights, there’s a shape to suit your caravan’s needs. You can also customise lights to suit whatever or wherever you need to fit them. For hard to reach or shadowed areas such as cupboards or under cabinets, mounted LED strip lighting is a great option. The length can be cut to suit the space, and there are even waterproof options available. For external caravan lighting, you can get options that are motion-activated, have an anti-bug setting, they’re dimmable, even multicoloured disco lights. We love the flexible LED lights just like this one here. They’re a great option for lighting up your annex, as they can be moved around as needed. They come with a full kit, which include mounting clips or Velcro fasteners, and are powered by a cigarette socket. They’re super bright and dimmable. Solar or battery operated lights are also a great option for lighting up around your caravan. They’re not usually as bright as your 12 volt lights, but they can still be quite handy, and you can place them around your site to light a path to your caravan, or identify the location of poles and ropes at nights. If you need more light in your caravan for your next trip, give us a call on 1300 227 353, and for more tips and tricks on four-wheel driving or caravaning, follow our YouTube channel. Hey guys, Briohny here from Accelerate Auto Electrics and Air Conditioning on the Sunshine Coast. Today we’re gonna show you through the 12-volt free camping fitout we’ve done on one of our customers’ Active Camper. It’s set up on the back of their BT-50. This setup has allowed them to go off-the-grid camping for an unlimited time as long as the sun’s shining. So come inside and check it out. So first up, we’ve upgraded their dual battery system. We’ve put a second dual battery in here so they’ve now got two dual batteries, two 120 amp hours. This has allowed them to store extra daylight in the batteries for when the sun’s not shining. Outside we’ve installed a cigarette socket here, and the customer has an annex light that plugs into there for the outside at night. So inside we’ve put a Redarc Battery Management System. This takes the input from the solar panels, 240 volts, or an Anderson plug if it’s plugged into the car and charging while driving. It then decides which is the best input to charge the batteries. It also gives us ratings of all the batteries and what’s currently being drawn and what input’s being put in at this point in time. We’ve also got this set up for a TV, so we’ve put in a bracket here and we’ve got an aerial in here. They plug the aerial in, and there’s an aerial on a pole that they can put out to get reception. Then just also under here, we’ve got two cigarette sockets, and another one on top so they can plug the TV into any of those. We’ve also mounted a 12-volt fan in here. So that’s nice and easy and adjustable for angling whichever way you want if you’re in the bed or having a seat at the table. In the cab of the BT-50, we’ve installed a Uniden UHF radio, and we’ve also got two reverse cameras. There’s one that clicks over their existing mirror here engages when they’re in reverse, and then we’ve got a second one here that’s attached to the rear of the camper. This allows them to permanently see behind the camper while they’re driving, it stays on all the time using heavy duty cabling. We’ve also put Airbag Man suspension under the tray. When the camper is on the back, they can pump up the suspension to return the car to its true ride height. When they take it off, they can let all the air out of the suspension there to put it back to normal hight for driving on the road. On the roof, we’ve also installed two 100-watt flexible solar panels. These solar panels take energy from the sun, pop it into the BMS, which then feeds into the batteries and keeps them fully charged. These guys can stay off the grid and don’t have to plug into 240-volt for as long as the sun’s shining. If you would like help with getting your Active Camper set up for off-the-grid camping, you can give us a call on 1300 227 353, or comment below. That’s Briohny from Accelerate Auto Electrics & Air Conditioning. What Solar Panels Do I Need? Solar panels are a great option for quiet, clean and free energy while caravanning or camping. With the right set up, you can travel just about anywhere without having to sacrifice life’s little luxuries like a fridge, LED lights and mobile devices. Also, swapping out a noisy generator for a solar system means less noise and pollution disrupting the peace and quiet you set out to enjoy on your trip. There are a number of different types of solar panels available for camping and caravanning. The size, type and number of panels you will need will depend on how you are planning on using the power you generate. There are three main types of solar cells that are used in today’s solar panels. Mono-crystalline, poly-crystalline, and thin film amorphous. Mono-crystalline panels are more expensive and work best in direct sunlight. Poly-crystalline panels are slightly less efficient than mono-crystalline panels but may function more efficiently in low-light conditions. Amorphous cells are made from thin, flexible film panels and require a larger surface area than traditional panels. The greatest advantage of the Amorphous cells is their ability to be rolled or folded in the form of solar blankets. This also allows for more compact storage. Fixed solar panels can be fitted to the top of most caravans, trailers or 4WDs which means you can generate energy as you travel. The downside of fixed panels is you may not always be able to position your caravan, trailer or vehicle in direct sunlight. This could reduce the amount of power that is generated from the panels. With portable panels, this is less of an issue as the panels can be repositioned in the sun as it moves throughout the day. This allows for maximum power to be generated from the solar panels, though it will add some extra time to your set up and pack down. A folding solar blanket or compact thin film panel is usually the best option to save space for campers or those short on storage space. What size and how many? How much power you need from your solar set up will depend on how you plan to use the power generated from your panels. Before power for and work out how much power they will use in a day. To do this, take the total number of amps your devices will use per hour and multiply it by the number of hours you will use them each day. For a complete, self-sufficient setup, you will need your solar panels, a solar regulator (also known as a charge controller) and a dual battery system. You will also need an inverter if you are wanting to power 240V devices. How to get the most from your Solar power. Solar power setups work best with low energy devices such as fridges, LED lights, air compressors and inverters. Avoid using the inverter to power energy-intensive appliances such as heaters or hair dryers. These will quickly drain the power you have stored in your battery. Camping and caravanning solar panels receive a lot more abuse when out and about. Make sure the panels you choose are made from sturdy materials. Also, ensure they can be stored easily when not in use and come with a well-designed carry bag. Keep your panels free of dust which can obstruct sunlight and detract from performance. To clean your panels, wipe them down regularly with a micro fibre cloth as using a more abrasive material may damage the panels. We can help customise your solar power solutions to your needs and all within your budget requirements. Sick of having your sausages floating around in ice slushy water at the bottom of the esky? That’s why when we started camping one of the first things we bought was a 12 volt camping fridge. At most campsites, you can buy bags of ice to keep the food and drinks in the esky cold, but now you have a 12 volt camping fridge how on earth do you keep the power running so the beers (and sausages) are icy cold? You have a few options, but like everything in life, there are pros and cons to all of them. Note: We do not recommend this type of setup. Your Starting or Cranking Battery is generally located under the bonnet of your car, its sole purpose in life is to start your car. Starting Batteries are great for starting a car, as these batteries deliver a big burst of energy for only a few seconds. You can run a cable from the starting battery to your 12 volt camping fridge and voilà the beers will get cold. However, starting batteries are not designed for powering a fridge where a low output is required for an extended period. Also, you will need to install an extra cigarette socket or Anderson plug in your car. The cigarette socket that comes standard from the factory will only provide power when the car is running. So when you are stopped overnight and the car is off it won’t power the fridge. This means you will need to install an extra outlet that is set up to power the fridge when the car is turned off. Most 12 volt camping fridges these days have a low battery cut-out feature. Basically, the fridge will turn off when the battery reaches a set voltage. The theory is if you go to bed with your fridge running from your starting battery, the low battery cut-out will turn the fridge off when the battery gets to a certain voltage. This will ensure there is sufficient power in your starting battery to start the vehicle the next day. Let’s just say, with the low battery cut-out you are skating on thin ice. If a light is left on in the car or you leave the door open for a few minutes you run the risk (and I speak from experience) that the car won’t start when you are in the middle of NOWHERE. The best way to ensure your fridge will stay cold overnight and your car will start in the morning is with a Dual Battery System. As the name suggest’s when you have a dual battery system installed you will have two batteries in your vehicle. The original starting battery and a 2nd auxiliary battery which can be used to power your 12 volt camping fridge and other 12 volt accessories. We generally recommend a dedicated deep cycle battery. Deep Cycle batteries are designed to consistently deliver small amounts of power, for much longer and to allow a much deeper discharge, reducing damage. The type of dual battery system you choose will depend on numerous things. Like everything in life, there are lots of options. 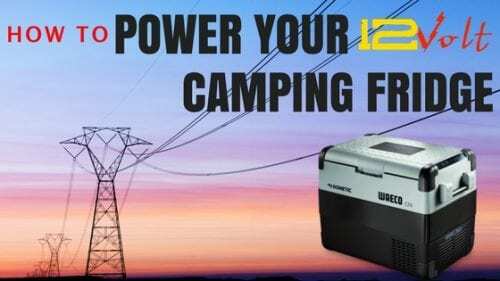 If like us, you have decided the dual battery is the best option to power your 12 volt camping fridge, you will need to look at ways to charge the battery. As we mentioned above, you can use your car’s starting battery to charge your auxiliary battery with quite a simple set up. However, if you want to go camping for longer than 2-3 days and driving around waiting for your auxiliary battery to charge doesn’t seem like a nice way to spend your relaxing trip, here are some other options for charging. In South East Queensland the sun shines on average 2,884 hours a year. So it makes sense to harness this free energy source to power your dual battery and fridge. There are lots of types of solar panels available to suit your needs as well as multiple sizes to ensure you have enough power to keep your fridge and gadgets charged. Our portable solar panel kits are the most simple, when your battery is running low you can easily put the solar panel out in the sun, plug it into the auxiliary battery and it will easily recharge your battery in a matter of hours. As the sun is shining you will be self-sufficient. We recommend as a minimum to have the “Auxiliary Battery with Vehicle Charge via Isolator” above. Oh the old Solar vs Generator debate (read our blog here on the great debate). I personally do prefer Solar due to the serenity. However generator’s are great if you want to stay off the grid without a huge setup cost. We do see a lot of people with bigger caravans that need to power lots of things like TV, Fridge, Washing Machine and do not have the room for multiple solar panels on the roof. We hope this information helps you find a solution to power your 12 volt camping fridge. If you are looking to get a dual battery system installed in your vehicle, the team at Accelerate Auto Electrics can come up with a system to suit your need. For a custom quote or more information, give us a call on 07 5479 6652 or contact us online. Not sure what kind of Dual Battery System is going to suit your needs? Want to learn more about powering your 12 Volt Accessories? Do I need a Solar Panel, Generator or both for my Caravan? The answer will depend on your needs. The biggest difference between solar panels and a generator is the power output. Solar panels will consistently charge your 12v battery. When used with an inverter, solar panels will also be able to power low-wattage appliances such as TV’s, mobiles and laptops. The consistent output from solar panels means there is no drain placed on the vehicle’s starter battery. Generators are the most practical way to have enough power to run very high-wattage appliances. It will supply 240v power allowing you to run appliances like the air conditioner and microwave oven. If you must have air conditioning when not plugged at a powered site, you will need to use a generator. Virtually maintenance free. Only charges/powers low wattage appliances. Quiet – No noise. Power is dependent on weather. Environmentally friendly – No fumes. Power restricted by size of panels. Power not dependent on weather. Produces fumes – Not Environmentally friendly. Most practical for high wattage appliances Requires regular services and maintenance. User friendly Can’t be used in most national parks in Australia. Solar is essentially a battery charger. So if extending your time at camp is your primary focus, they’re the preferred option. Generators provide significant amounts of power in a short period. While solar provides a steady charge and have the best chance of getting your batteries up to 100%. The best advice is to have a serious think about the absolute necessary appliances you want to take camping. Consider their power usage (watts – this should be on the label of the appliance) and estimate how long you expect to be using them each day. An auto electrician will also be a great source to talk with. We can help customise your power solutions to your needs and all within your budget requirements. Call us today 1300 CAR ELEC (1300 227 353) or pop into our workshop at 17 Trinder Avenue, Maroochydore QLD 4558.